Manufacturing business made easy with Zybra. How often your stock in books does not match the stock in hand?? You have used the raw materials but level of finished goods don’t reflect new production in your books!! Oops, you forgot to account all the raw materials used in production!! Efficiently managing production at factory v/s efficiently accounting it- You might feel the former is easier! Manufacturing business is a process; the process that turns raw materials into finished products. Therefore, manufacturing business purchases, maintains and supplies material inventories in bulk. Managing stock without increasing costs, is the one of the biggest challenge of a manufacturing business. Consequently, cost effective management needs a proper accounting of materials at all stages of the process. For small business owners, this can be a tough job. 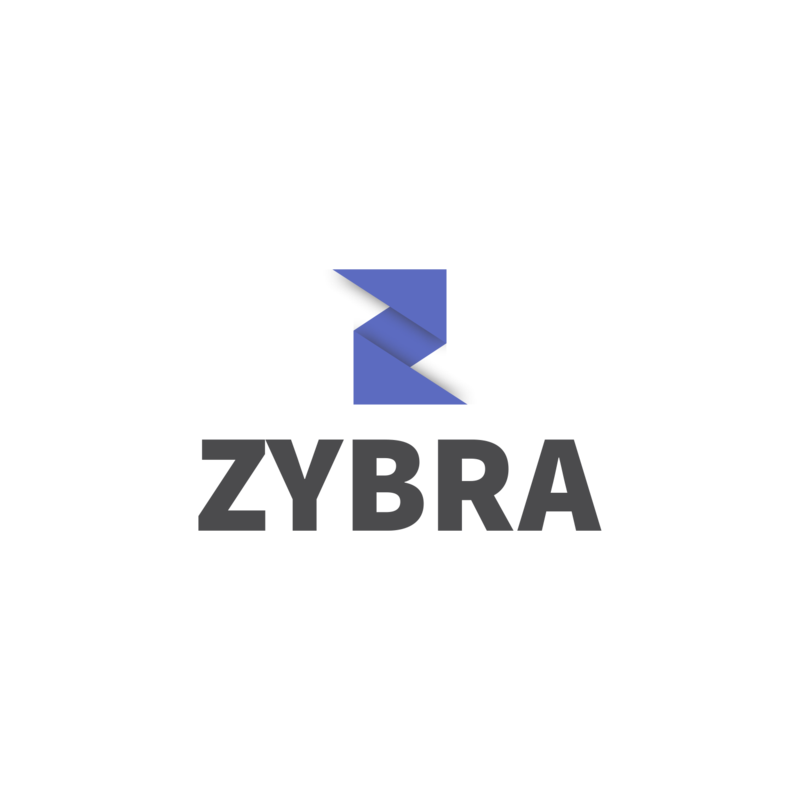 Zybra is a cloud based accounting software, which has come up with an innovative solution for small manufacturing business. It was the first ever online software to launch this accounting solution. Zybra’s unique feature makes Stock Journal and bill of materials, together. Honey Manufacturers Pvt. Ltd produces honey bottles in the batches of 100 each. Each bottle contains 100 grams of honey. A 100 gm empty bottle. Later, after production of each batch of honey bottles, stock levels have to be accordingly updated. Using Zybra, the manufacturer at Honey Manufacturers, makes only a single entry of production into the software. This single entry reflects the reductions in the raw material stocks of raw honey and bottles. Also, it reflects the increase in the inventory at finished goods. As a result,the amounts of the stocks accordingly reflect production and consumption at Honey Manufacturers. In conclusion, the software accounts the materials simultaneously at, raw material and finished goods, stocks in hand. Seems like this was the only thing you wanted!! The manufacturer had filled in a “Bill of Materials” in the software. This is called the recipe of the production process. It instructs the software the consumption details of raw materials used. Hence, after production (100 units), stock of raw honey had to be deducted by 10 kg, that of empty bottles be reduced by 100 and stock of finished goods had to be increased by 100 ready honey bottles. This recipe was entered into the software. After production, the manufacturer will to go the stock journal for making an entry of accounting production. First of all, Select the product .i.e. honey bottles, software will by default show a production of 1 batch. The value of raw materials consumed and the value of finished products produced are both reflected accordingly. On pressing save, stock levels are updated in the software for both raw materials and finished goods. Moreover, the user can change the quantity of goods produced and raw material quantities will change accordingly. What Zybra has for you?? 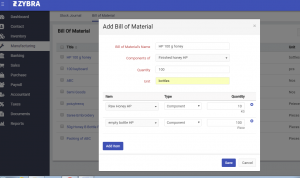 Zybra enables you to develop such bills of materials for all of your manufacturing processes. Users can enter such process recipes for all their products in any desired number of units. Then, the software will accordingly make changes in stock at every given level of production. Zybra provides this unique feature into an online software to improve your business efficiency at anytime in anyplace. As it goes, better systems make better businesses. Small manufacturing business owners can prepare themselves with smart systems to comfort their operations. And, automation using technology empowers you to increase your efficiency. So that, you can then focus on other important tasks of your manufacturing business. No more ignoring your accounting and no more mismatches in stocks in hand and in books!! Manufacturing business has an online partner- Zybra Accounting Software, Signup now to try out this feature.